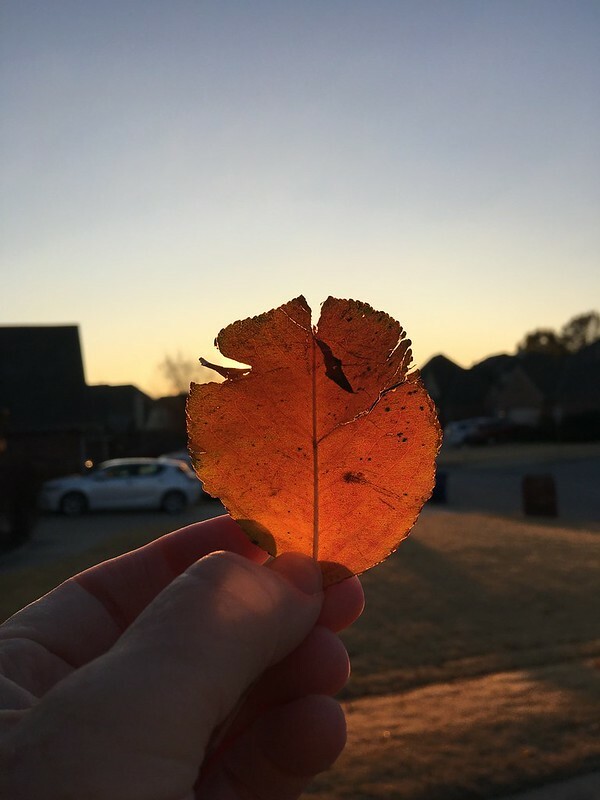 Tuesday morning the sun was coming up in the neighborhood and so I grabbed a leaf and occluded the sun with it. I am an arty kind of guy you know. Especially the easy kind of art like this. I don’t think of it as being lazy, I think it is being efficient. 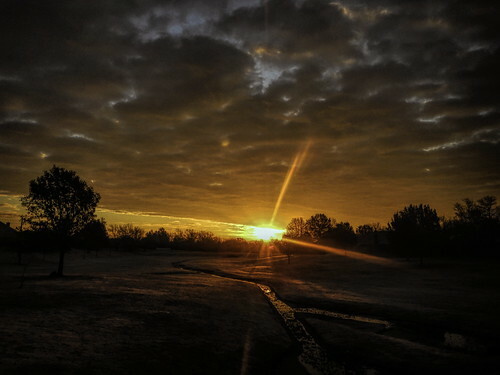 On my way out of the neighborhood I stopped at the greenbelt and snapped another pic of the sunrise. The greenbelt starts close to our back fence and loops around to the road I am stood on to take this photo. 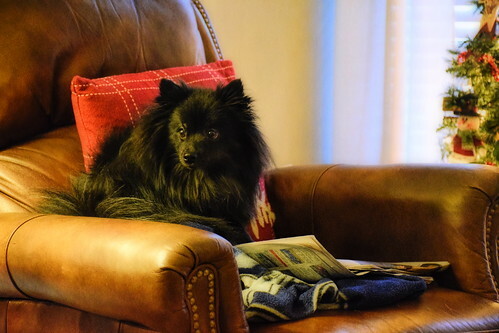 Sunday night during our front that moved through with strong winds and icy temperatures we noticed that our Pomeranian, Rascal had disappeared. Further notice showed that our gate to the greenbelt had blown open with the wind. So I was walking in the pitch dark with a flashlight yelling “Rascal” over and over. Heather had started in a different direction doing the same thing. I left the greenbelt and was looking for the dog on a street when Heather picked me up and dropped me off at the house so I could enlist social media to help. I put together a facebook post and sent it off and then a similar NextDoor post. It was pretty amazing. We started getting responses right away and it turns out that Rascal had walked up to a couple putting up Christmas Tree lights and they took him in and posted something on facebook that somebody else reposted on next door and then somebody else let me know about the other post, and we were re-united fairly quickly which was kind of amazing because I thought we had lost him for good. Say what you want about Social Media but I like it and it does have its uses. This entry was posted in Uncategorized and tagged NextDoor, Rascal, Skywatch Friday on November 27, 2018 by Alan Bates. 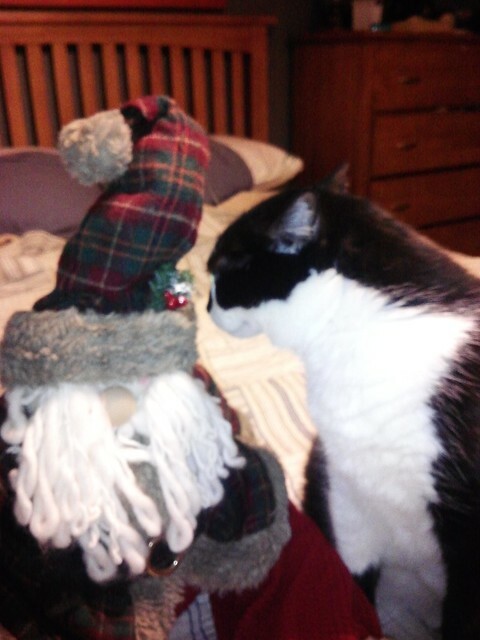 Here is LJ the Cat. 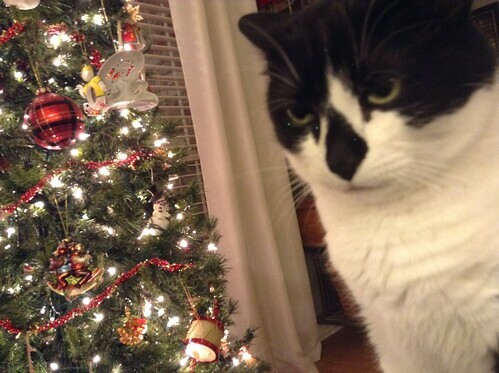 This time of year if he is not sleeping in front of the fire he is striking poses next to the Christmas tree. Although the tree came down the other day so he is back at the fire place. 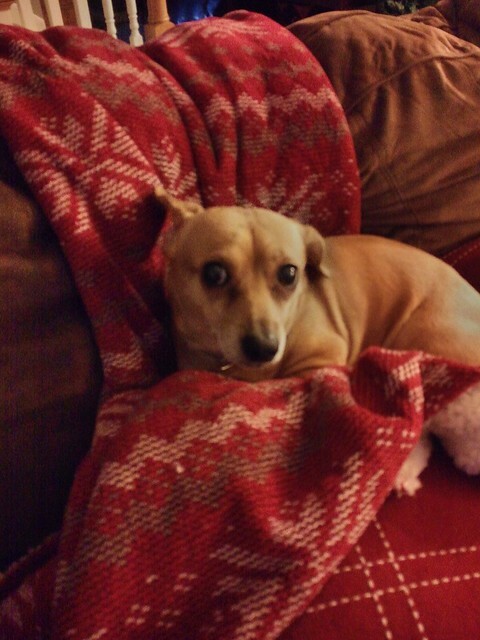 And Ginger our rescue dachsund mix (all of our pets are mutts). She freezes all winter. Winter to her here in Oklahoma is from September through May. Andy Abby our fun loving dog. 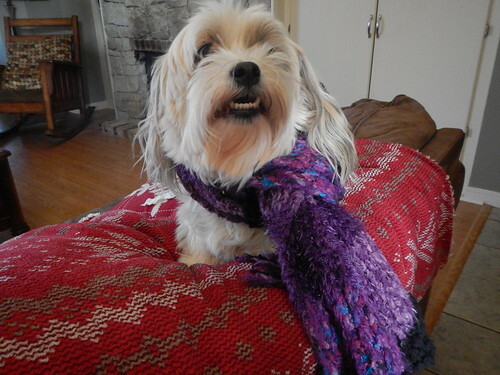 She is up for anything, scarves, hats, walks, adventure, she loves it all. And this is Rascal. We didn’t adopt him, he showed up one day and adopted us. We tried really hard for about three hours to find his owner. He is kind of our baby, he is alert, watches everyone and everything, and is in tune with us all the time and is probably the smartest dog we have ever had. So those are our New Year’s Critters. This entry was posted in Saturday's Critters and tagged Abby, Cats, Critters, Dogs, Ginger, LJ, Pets, Rascal, Saturday's Critters on January 2, 2016 by Alan Bates. We have four critters at the house these days. I mean not counting the squirrels in the back yard. Three dogs and a cat. The last couple days I posted pictures of them on Instagram in a kind of popularity contest to see who could get the most likes. The contestants and the votes so far? 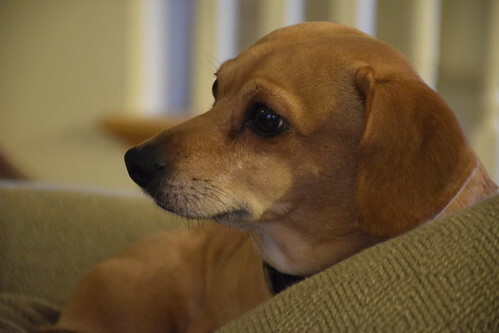 This is Ginger, our sweet Dachsund mix rescue dog. As of Monday night she had 26 likes. 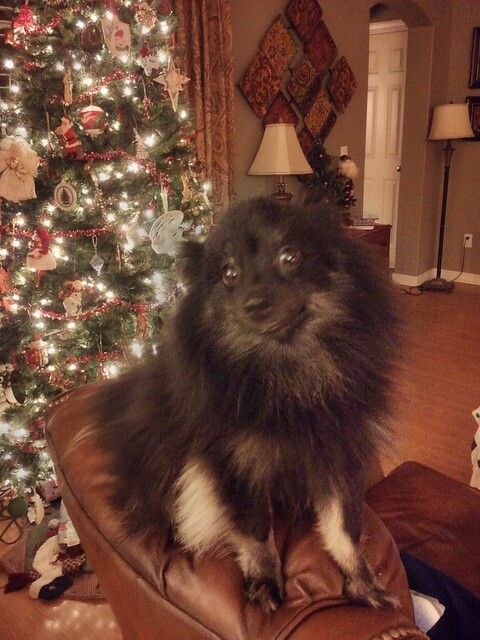 This is Rascal, our sweet lovable Pomeranian mix who just showed up at our house. We tried really hard for about a half hour to find his owner. He is the leader as of Monday night at 30 likes. 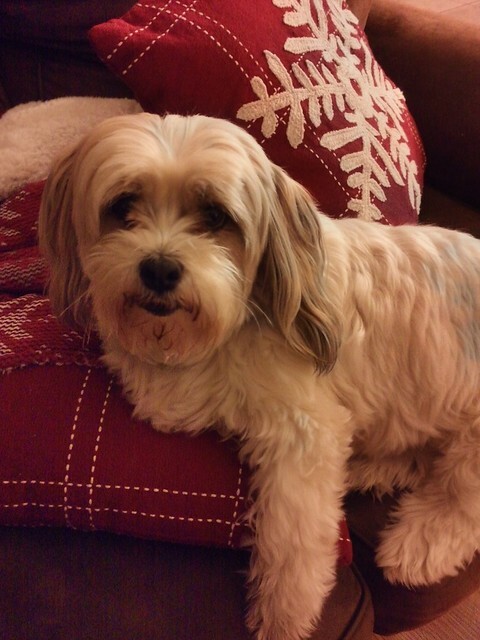 This is Abigail our sweet Shi-Tzu Maltese mix who was given to us by a breeder. She loves to eat and also likes a pillow when she sleeps. She is at 25 likes. This is LJ, Logan’s cat (LJ is short of “Logan Junior”) he has 14 likes but I didn’t post his pic until a day after the others. 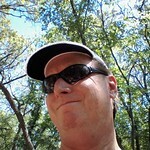 We are keeping all four the critters regardless of what happens. What about you? Tell us about your critters. 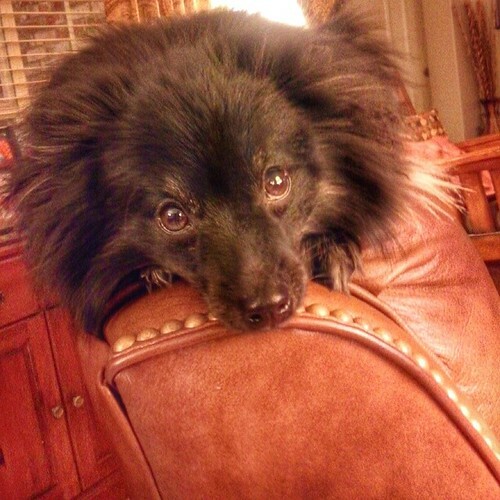 This entry was posted in Pets and tagged Abby, Animals, Cats, Critters, Dogs, Ginger, Instagram, LJ, Pets, Rascal on December 22, 2014 by Alan Bates.